« Do Republicans Really Want to Create 12 Million Refugees? I've often noticed that, too. Almost all of the worst places in the world used to be French colonies. The British, by comparison, left some pretty functional nations in their wake. I've always pondered the difference in their management styles that created this difference. On one level, I think the British were so practical and (relatively) egalitarian that they tended to instruct, include and improve their subjects rather than simply exploit them. With as many data points as we have, it would be pretty difficult to deny at LEAST a correlation between British colonial success vs French/Dutch colonial nightmares. Or Spanish, or Portuguese, or worst of all, Belgian. Nikolai Wenzel of Flagler College suggested the reason is British colonies used common law, as opposed to civil law, with more predictable applications of government force in common law countries. Makes sense to me. The British adapted what they did to circumstances: I imagine that the French were likely to have adopted a one-size-fits-all centralised policy. I particularly admire the East India Company's attitude to Christian missionaries: it did its damnedest to keep 'em out of India. It left the Hindus and Moslems to pursue their religions, balking at just a couple of things that the British found unbearable - chucking widows on their husbands' funeral pyres, particularly. Love the Lede... Bumper Sticker worthy. Interesting. There seems a more direct line to commercial interests by the British vs a mix of interests including religious ones with the Spanish, French, Portuguese. Does this hold for Dutch colonies, which were similar to British in motivation and organization? I think you're onto something. If the primary interest was commercial, then a primary goal was a predictable legal system where contracts are enforced. I worked in Hong Kong for six years and felt that the biggest gift that the British gave Hong Kong was the rule of law. Hong Kong was (and still is in many ways) a gem - a great example of what the entrepreneurial spirit can bring with little government oversight, and few natural resources. Considered taking a job there, but it was too close to the turn over to the Chinese and much uncertainty on how that would play out. Former British colonies have done right well by and large. Certainly Hong Kong and Singapore are economic stars today based largely on British administration. But of course in these two cases one has to give a lot credit to the Chinese culture. Don't hear many people complaining about Britain in Bermuda, Bahamas, and even Belize either. Actually, it's pretty hard to find a hell hole where the Brits ruled. Gibraltar and the Falklands will elect to remain British territories until the sun goes nova. It wasn't more than a few decades ago - i.e. into Spain's democratic era - that a Spanish minister complained that Gibraltar should be handed over because Britain had violated a term of the treaty that awarded Gib to her. Specifically the treaty banned Moors and Jews from the Rock. It was, he said, outrageous that the Chief Minister of Gibraltar - Sir Joshua Hassan - was both a Moor and a Jew. The exceptions I can think of to the former British colony thesis are Pakistan, Afghanistan, and Bangladesh. Although in some fairness, the British never really controlled anything outside the major cities in Afghanistan, Pakistan got screwed up after partition by the direct rejection of their British past, and Bangladesh was a mono-crop economy, based on a crop that suddenly no one wanted any more after the invention of Nylon and Polyester fabrics. I remember reading in a P J O'Rourke book that the two great gifts of the British were the notion of equality before the law, and a law to be equal before. It looks to me like an increase from around $15k to $22k, roughly a 50% increase. Two factors at play here, the rapid increase in Singapore tends to flatten the world-wide trend line, and the PPP and inflation corrections have a moderating effect on any trend as well. 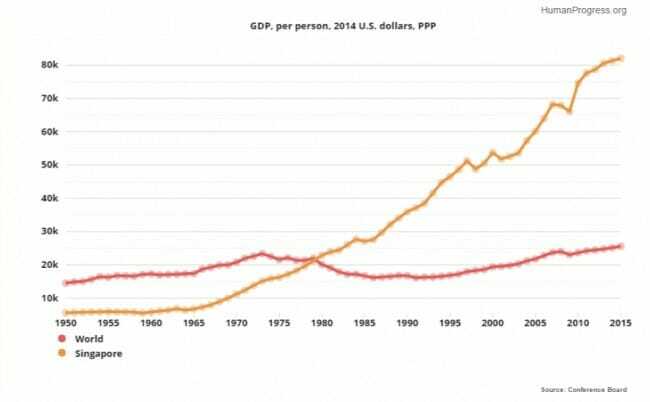 The graph is saying that the world hasn't gotten richer at all since the early 1970's. I find that hard to believe. 40 years of no progress? Especially when you factor that China and Indian are around 1/2 of the world's population and they have gotten significantly richer since the early 70's. What country could you argue is poorer today than in the early 70's? To answer the last question first, I'd say Russia and many of the other former Soviet Republics, less that Baltic states. The Horn of Africa region, Cuba, and Southern Africa as well. However, that's not what drives the trend flat. It's the mathematical manipulation from the purchasing power parity and constant dollars calculations that tend to make the worldwide trend flat. If you put them in a different context, the world-wide trend should be completely flat over time assuming constant standard of living (if income and expenses both double over time, the trend over that interval would be completely flat). What it actually shows is that the average person in the world had his standard of living increased by 50% over the interval. Part of the problem with these calculations is that much of the increase in standard of living involves technologies that were not available early in the graph. How do you account for things like having cell phones or satellite TV in India and China today when they were available nowhere in the early years of the graph. I was there for the Handover, and it was pretty uneventful. Apparently when people know that something is coming for 13 years, it's not a surprise. Still, that wasn't guaranteed. There were a couple times in the months leading up when there was some sort of mild, low-level protest (someone flying a Taiwan flag or something) where Chinese officials said that they might need to take over early because of the 'unrest'. "Men speak of natural rights, but I challenge any one to show where in nature any rights existed or were recognized until there was established for their declaration and protection a duly promulgated body of corresponding laws." Coyote Blog: Though I will say that, speaking of colonialism, it tends to support my old argument that it sure was better in the long-run to be a British or American rather than a French colony. The British in North American completely exterminated many Native American peoples, and ethnically cleansed the rest.